Clarence Jay Ramer: minister and bishop in the Duchess Mennonite Church at Duchess, Alberta, was born 30 May 1905 in Martinsburg, Pennsylvania, and died of cancer on 22 August 1987 at Duchess, Alberta. 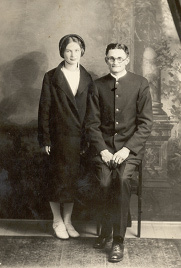 He married Ethel Martin on 26 April 1931. They had 9 children, two of whom died in infancy. Clarence Ramer had a conversion experience at the age of eleven while the family was living in Altoona, Pennsylvania. He was baptized and received into the membership of the Altoona Mennonite Mission in 1916. The following year the family followed other relatives to Duchess, Alberta. On the farm Clarence learned a lot about riding and training horses, eventually becoming an experienced cowboy and bronco rider. His father and grandfather were ministers in the Duchess church, and his older brother served as a deacon in the same church. In 1927 Clarence left Duchess to attend the Eastern Mennonite School at Harrisonburg, Virginia. He returned to Duchess to help on the family farm during the summer. He had dreams of becoming a missionary in Africa and returned to Virginia in the fall of 1928 to prepare for an overseas career. But in November he was informed that his brother had been killed and that he was needed at home to help with the farm work. In the winter of 1928-29, after his return to Duchess, Clarence organized a Bible study class or Bible school in the Duchess church, which also attracted students for other nearby Mennonite communities. On 29 April 1929, at the age of 23, he was chosen by lot and ordained to the office of minister in the Duchess Mennonite Church. He was keenly interested in the study of the Scriptures and in January of 1934 he and Ethel returned to Eastern Mennonite School to complete some of the courses Clarence had dropped after his brother's death. Then, in December of 1934, he was instrumental in organizing an unusual Winter Bible School. Three weeks of Bible study were offered successively in the Duchess, Salem (near Tofield) and West Zion (near Carstairs) congregations. Arrangements were made so students from outside those communities could attend one or more of those sessions. The teachers that first year were Clarence Ramer, Milo Stutzman and Ezra Stauffer. The instruction was well received and continued for more than twenty-five years. A topic which particularly fascinated Clarence Ramer was the Old Testament Tabernacle. A special small model was built as a teaching aid in the Tabernacle classes. Clarence was also interested and taught classes in Bible prophecy and later some of his lecture notes were published in a book entitled God's Unfolding Plan. The Winter Bible School became a strong unifying force in the conference, providing instruction for a generation of Alberta-Saskatchewan Mennonite Conference leaders. At various times Ramer also taught at other Mennonite Bible Schools and served for a time as Acting Principal of the Western Mennonite School in Oregon. Family members had to make many sacrifices to keep the home and farm, which included a thriving dairy. In the winter of 1931-32 Clarence Ramer preached every other Sunday in a small mission the conference tried to establish in Calgary. The group met in a room rented in the city's public library, but the effort was eventually abandoned because of depressed economic conditions and uncertainty about the place of a city mission in the conference program. Ramer also provided strong leadership and took a very active interest in the sending of mission workers and voluntary service workers to unchurched or under-churched communities in northern Alberta. Clarence Ramer occupied a number of leadership positions in the Alberta-Saskatchewan Mennonite Conference, including that of Moderator. He also served on the General Board of the Mennonite Church General Conference. He was ordained as Bishop on 13 July 1941, and served the Duchess church and the conference in that capacity for the rest of his life. His ministry was, however, tested by some divisive debates and schisms in the Duchess church, focusing mainly on matters such as the preservation of traditional non-conformist Mennonite lifestyles and evangelistic outreach and mission strategies. Clarence Ramer was, in the words of a colleague, "...a man of conviction and principle with depth of wisdom sometimes beyond our capacity to fully comprehend." Duchess and District Memoirs. Brooks, Alberta: Nesbitt Publishing Company, 1980: 343-350. "Duchess Mennonite Church History." 25 May 1997. Unpublished manuscript made available by Mary Burkholder. Mennonite Reporter (14 September 1987): 4. Northwest Conference of the Mennonite Church Newsletter. Obituary Notice for Clarence Ramer in the Gospel Herald. Regehr, T. D. Faith, Life and Witness in the Northwest, 1903-2003. Centennial History of the Northwest Mennonite Conference. Kitchener, ON : Pandora Press, 2003. Stauffer, Ezra. History of the Alberta-Saskatchewan Mennonite Conference. Ryley, Alberta: Alberta-Saskatchewan Mennonite Conference, 1960: 77-78. Regehr, Ted D. "Ramer, Clarence J. (1905-1987)." Global Anabaptist Mennonite Encyclopedia Online. December 2003. Web. 23 Apr 2019. http://gameo.org/index.php?title=Ramer,_Clarence_J._(1905-1987)&oldid=143323. Regehr, Ted D. (December 2003). Ramer, Clarence J. (1905-1987). Global Anabaptist Mennonite Encyclopedia Online. Retrieved 23 April 2019, from http://gameo.org/index.php?title=Ramer,_Clarence_J._(1905-1987)&oldid=143323.